Really cute Turkey Pops, Kitty. 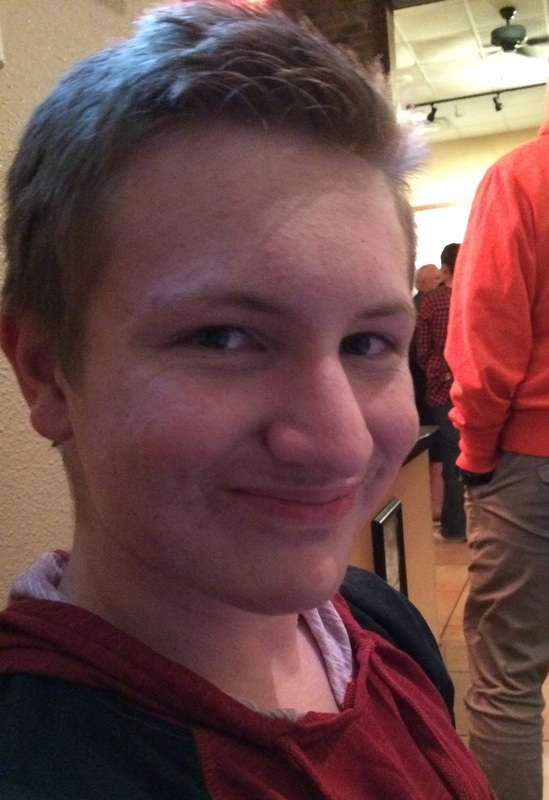 Grandchildren are the best, they always bring a smile to my face. These are the cutest turkey pops! I bet the kids all had so much fun at your cooking camp! 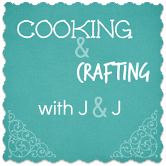 Thank you for joining and sharing this at Cooking and Crafting with J&J. Too cute! You have the best cooking camp activities! Wow -- you have a houseful! It is so fun that you can entertain them with your skills in this way. Aww! This is such a cute idea! 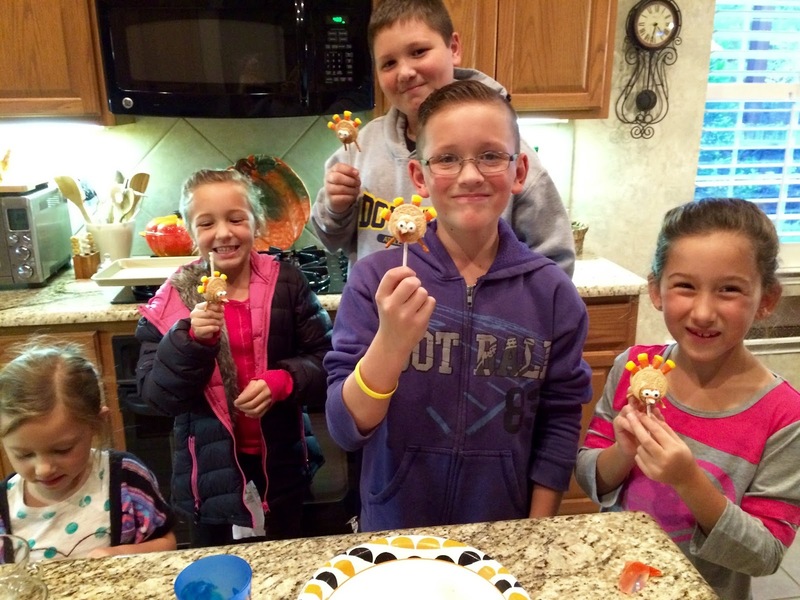 The turkey pops are so cute, Kitty, and so are those grandchildren of yours! You have to be one of the coolest grammas out there! 3-D movies are great if you can watch them. They always make me dizzy in the beginning and it takes me a while to adapt to it. Thank you for sharing with us and have a lovely day, my friend. Kitty!! Sweet, sweet friend of mine....I have missed you so! How have you been? I feel like it's been ages and ages since I have chatted with you. Kitty, these turkey pops are adorable!! This is the best kind of fun! Hi Kitty, oh so very adorable. I love your turkey pops and your grands are simply precious. Look at those smiling faces with their turkey pop creations. From the oldest to the youngest you have a beautiful family. Cooking camp at your house is so much fun and you are the best grandmother. Thank you for sharing the directions. Thank you also for stopping by and your sweet visit. More fun! I think your eldest grandson would happily eat the turkeys and your little ballerina is wondering why she doesn't have cookie! Too cute. Oh how fun Nana! They were obviously very happy with their creations and time with you in the kitchen Adorable turkey pops!!. Fun times and treasured memories! The grands are all adorable, from the oldest to the youngest. I really miss these times. Turkey pops are so cute! You think of the most fun things to do with your grands. They must love spending time with you. The turkey pops are adorable! So cute, Kitty! Your grandchildren are so blessed to have such a fun Nana to organize cooking camps for them. Love seeing them and their happy faces, including the oldest and youngest one. What a blessing! So much fun. They are adorable... the kids and the pops. It looks like a happy group in your kitchen Kitty and the turkey pops are adorable. You always come up with the cutest ideas! What a fun Nanna you are, and the kiddies are adorable! Hi Kitty, I love your turkey pops! I hope you will stop by our link party on Monday as I have a surprise for you! Enjoy the weekend. It's been a while. This post put a big smile on my face. What lucky kiddos to have you for a nana! I can only imagine the fun you all have. 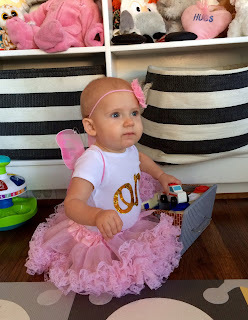 These little treats are so cute and your grandchildren are adorable and obviously having a ball! Hope you have a nice weekend! Miss you! Kitty, what a fun grandma you are! 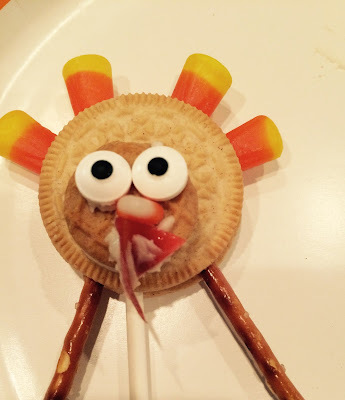 The turkey pops are so fun and I bet the kids loved making them. Thanks for sharing with SYC. Oh Kitty! These Turkey Pops are simply gorgeous! And what fun they must have been to make for your grandchilden! Sending you much dear love and a hug! Look at little Harper! Getting so big! Cute cookies, bet they enjoyed eating them. Your Turkey Pops are just adorable and will be featured this Full Plate Thursday this week. Wishing you and your family a bountiful Thanksgiving and thanks so much for sharing with Full Plate Thursday.